With so many fabulous ski resorts in the world, how do you know which is the best choice for your family? The 2018 World’s Best Family Ski Resorts Awards from Ski & Snowboard with Kids make it easy, with a panel of experts (and our readers) voting for their guaranteed crowd-pleasers, whether you’re looking for beginner-friendly slopes or expert-level terrain parks. Our judging panel of ski experts features some of the most well-known names in snow journalism, including our editor, Helen Hayes, Rachael Oakes-Ash (aka Miss Snow It All) and Owain Price (managing director of Snow Action magazine), alongside respected members of the industry, including Ben Cardenas from Travelplan, Rodney Muller from Skimax, Rachelle Matheson of Mogul Ski World, Belinda White from SkiJapan.com, Dale Goulding from Deep Powder Snow Holidays and Phil Osborn from Snow Travel Expo. 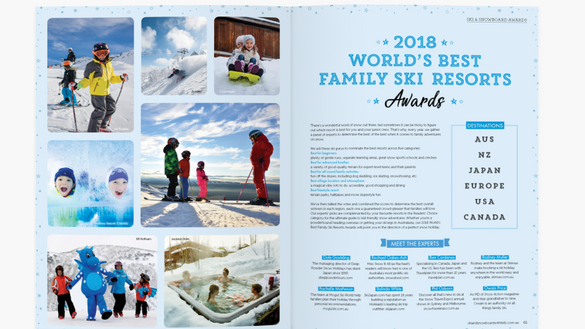 Ski & Snowboard with Kids, Australasia’s only stand-alone snow travel magazine devoted to families is out now, featuring the fifth annual World’s Best Family Ski Resorts Awards, an essential resource for any family planning a snow getaway. The Best Family Ski Resort title was awarded based on our experts’ votes across five categories. As part of our annual Readers’ Survey, our audience voted for their favourite snow resorts in Australia and overseas, which we then broke down into regions. Ski & Snowboard with Kids magazine is the first Australian publication of its kind, acting as the ultimate family guide to snow travel, from snow bunnies just getting their ski legs to speed-mad teens looking for first tracks. As well as sharing the latest news from the resorts of the Southern Hemisphere, we provide first-person insight into and expert advice about the best family-friendly ski resorts of Japan, Europe, the USA and Canada. We also review the hottest gear, chat with Olympians and rising snow sports stars and look at all the après-ski fun you can have off the slopes. Ski & Snowboard with Kids is published annually and is sold with the winter edition of Holidays with Kids magazine, Australia’s #1 family travel publication, with a quarterly audience of 600,000 families looking to be inspired by the wonders of the world. Holidays with Kids is Australia’s authority on family travel and is one of Australia’s highest-circulating and most-established travel magazines. It is produced in Sydney by Signature Media, Australia’s leading independent publisher of family and luxury travel titles.